"Come on there's no fighting, it's Earth Day," I heard my husband say to my kids. Yeah, we'll find a way to turn a holiday into a tool to manipulate our children. Soon there will be a Mother Earth character that floats all across the world leaving treats along with pamphlets on recycling for kids everywhere rich or poor. And yes, then there will be a blog post about how everyone gets too Mother Earth crazy and it's too expensive. But for now, Earth Day is still this really wonderful day that helps remind us all that we can do better. It reminds us that we can all do our part--recycle, go green, plant a tree, take shorter showers, buy food locally, etc. 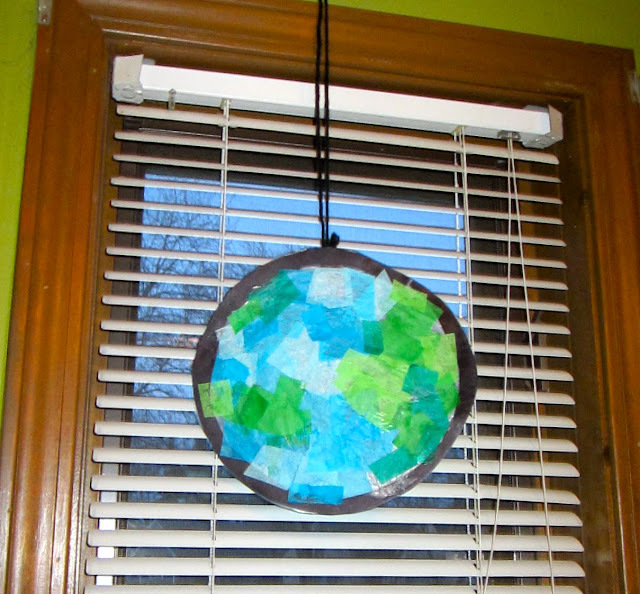 While my kids are young, Earth Day is going to also be about special treats and crafts. 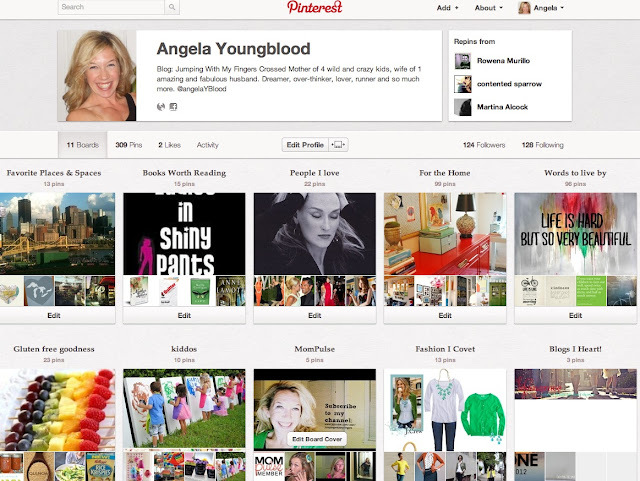 And what better place to get treats and craft ideas than Pinterest? (Yes I realize Earth Day was yesterday and this post may feel a little behind. But that's just how I roll. The treats were made with two boxes of Betty Crocker Gluten Free Yellow Cake Mix. I use two boxes because gluten free mixes usually are not very um, fluffy. 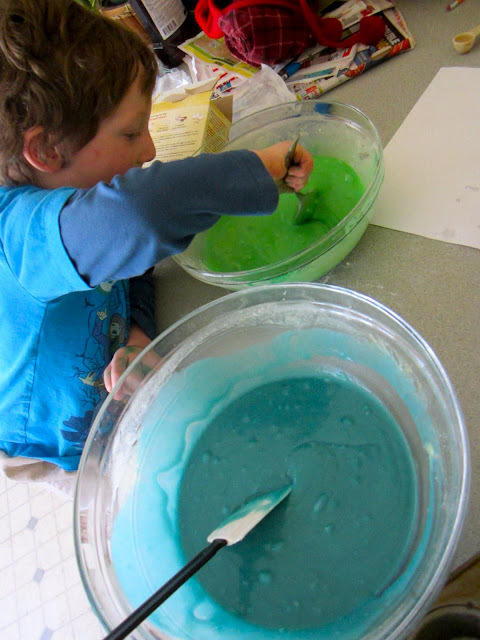 I followed the directions on the boxes and then put blue food coloring in one bowl and green in the other. Then I poured in spoonfuls of each color into the muffin tin. 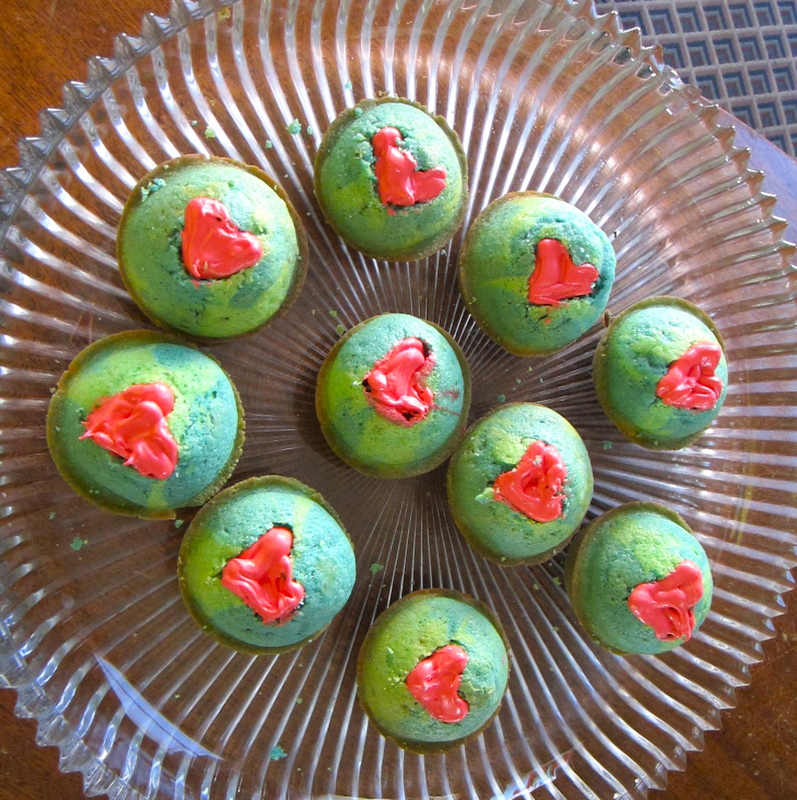 When they were out of the oven and cooled off, I cut out heart shapes in each cupcake. I filled each cutout with red frosting. And BAM, I had very yummy gluten-free "I Love Mother Earth Cupcakes." this Pinterest project was a success. This project involved two of my favorites ModPodge and tissue paper. It was simple, messy and fun for the kids. We started by cutting different shades of blue and green tissue paper into squares. Then we took a plate and traced it onto wax paper. We smothered the ModPodge onto the wax paper and stuck the tissue squares on in an Earthy design. We cut out a black construction paper circle to frame the wax paper, taped a string on the back and hung it in front of the window. It turned out looking like a circle with a bunch of paper haphazardly glued to it. I mean it looked like Earth? Not my favorite Pinterest project, but it did keep the kids busy for five minutes. And we talked about Earth Day together. Have you made something from Pinterest lately? Had any great successes? Did you do anything special for Earth Day? Those cupcakes were SO good! Cute and tasty...definitely a success.